Falling Wedge is a reversal bullish pattern that resembles the shape of a cone heading down-right direction. The prior trend can be from any direction. It can be an even before trending bear market and it can be a preceding upward trend, while the falling wedge represents a correction. Inside a pattern, a security price goes between two converging lines (support and resistance ) hitting both at least 5 times for a period of at least one month. It is essential that the price makes lower highs and lower lows to form a tapering pattern, where bulls and bears exchange the shares in a shrinking range and decreased volume. As a trading steam fades, the lower support line may slightly slope up giving the market a short and final consolidation until the price breaks through the resistance – bears lose control and bulls gain power. The break happens when a price goes through and stays (ideally gaps up) above the resistance line. During the breakout, the volume tends to be higher and RSI penetrates via 50 level. The price tends to go lower after the break when it simply looks for its new support – this is our resistance line that becomes a new support trend line. That is a confirmation of a typical bullish pattern of falling wedge, however, it also could be broken down through the support line, which would mean a bearish behavior and thus, a short position should be taken instead. A success rate of such case is 3 out of 10 – not that great. Once the security has started its bull run, the estimated target price is the same level as the top of the pattern when it started. Using a horizontal line on a chart gives the target price for this trade. It doesn’t necessarily need to go that far and thus, a current trend should be followed in case it is broken sooner. 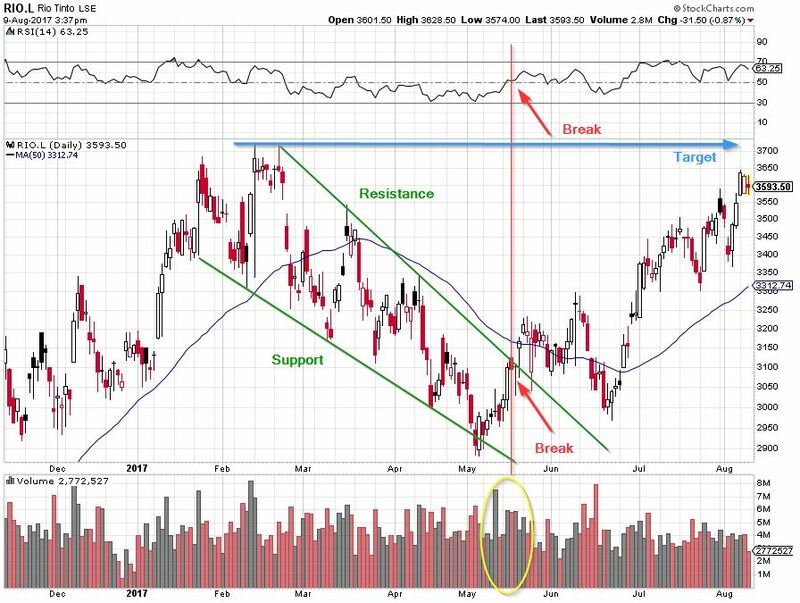 Looking at an example above, Rio Tinto was bouncing between the support and resistance trendlines until it broke up (gap up would signal even better performance) in the middle of May. Then, after little consolidation, it has taken upward run for several months.